If you’ve ever looked into cleaning your own pool, you may have been overwhelmed with all the specific, highly technical names for each chemical. Some companies do this because they want you to feel confused and rely on them to clean your pool for you. But, fear not! While there are some pool chemicals that are a bit more complicated than most, there are plenty of straightforward options that can keep your pool clean and inviting with minimal use. Chlorine is the most common pool cleaning chemical. Whether you own a pool or you’ve been swimming in public ones for years, you’re likely familiar with its distinct smell and the way that it can burn your eyes or skin if you spend too much time in the water. Chlorine is used to kill bacteria and algae, and it is an extremely cost-effective sanitizer. The most popular way to add chlorine to your pool is in the form of tablets. These tablets can be added either through your pool’s skimmers or through a basket that floats in the water. Though chlorine is inexpensive and easy to use, the levels of “free chlorine” versus “combined chlorine” and “total chlorine” need to be monitored. According to Swim University, the moment chlorine is introduced to your pool’s water, it forms hypochlorous acid and hypochlorite ions that break down when introduced to sunlight. These compounds form free chlorine, or chlorine that can effectively sanitize your pool’s water. However, when these compounds start interacting with other chemicals in your water like nitrogen and ammonia, this will result in combined chlorine, which is substantially less effective when it comes to keeping your water sanitized. This is why you will occasionally need to “shock” your pool, which involves you putting a heavy dose of chlorine in at one time to kill any bacteria. 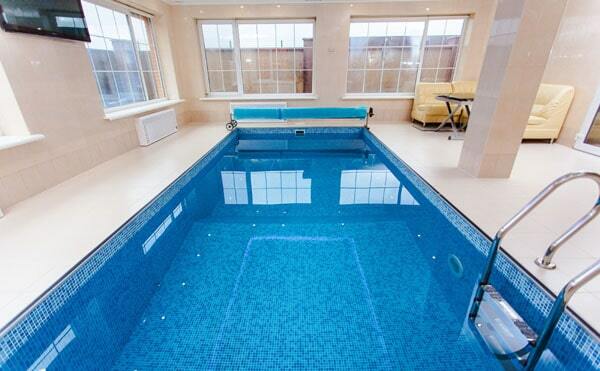 Monitoring your chlorine levels will give you an idea when that needs to be done. Though it’s a bit more expensive, biguanide is a great alternative to chlorine. It performs the same functions, but can also help to make your water feel a little smoother when you’re swimming in it. Because of this, some people prefer to use it over chlorine. Biguanide usually comes in liquid form and, should you decide to use it, avoid mixing it with other pool chemicals. Consult the instructions on your specific bottle for more information. Although bromine is chemically similar to chlorine, there are some distinct differences that you should be aware of. Bromine is a great option for small indoor pools or hot tubs. In fact, you will probably prefer it because it has a much subtler smell, preventing the off-putting scent of chlorine when it’s trapped inside. However, it is not recommended to use bromine for your outdoor pools. This is because it breaks down easier than chlorine does when hit by sunlight, making it much less effective at killing algae and bacteria. Though it’s highly effective, using bromine outdoors requires you to use more of it, costing you more money and more effort maintaining your pool. It’s important to note that if you’re going to be cleaning your pool yourself, you need to have the proper equipment to monitor the chemical levels. This ensures that your pool stays protected and clean, and helps you to avoid swimming in a pool where the chemical levels are too high. 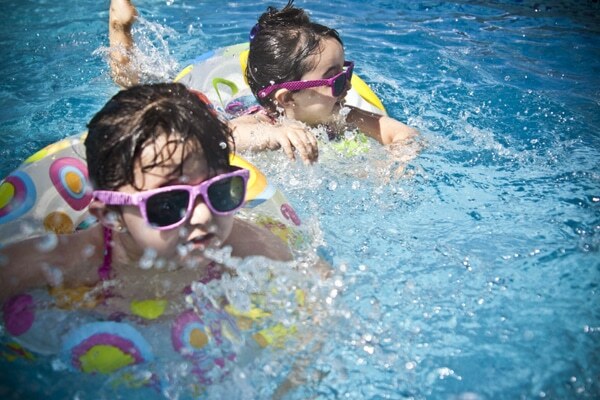 When a pool has too much chlorine, it can irritate your eyes and skin, and can even cause problems with asthma. In fact, the CDC has reported numerous hospitalizations because of improper chemical levels in pools. When maintenance experts talk about the “levels” that chemicals affect, this is referring to the pool’s pH, alkaline, and more. 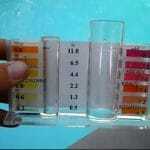 The pH level indicates the water’s acidic / basic nature. Untreated water, such as drinking water or anything that flows through your home’s plumbing, typically has a pH level around 6-8, with 7 being considered neutral. To maintain an ideal pH balance, you’ll need to be mindful of which chemicals you’re introducing to your pool’s water, how frequently you’re using them, and at which quantities they’re being utilized. If needed, you may need to supplement with other chemicals like pH and alkaline boosters to ensure your water is balanced. No two pools are exactly alike, so after measuring yours, be sure to research exactly what products you need and how much of each to use. As you can see, choosing chemicals for your pool is actually a fairly smooth process. Don’t be dismayed by all the confusing chemicals, as there are only a few primary chemicals to choose from. Though these chemicals require some maintenance, any myths or misinformation can be dispelled with research and consultations with dedicated pool experts. Armed with this information, you’ll be able to get your pool ready for the long season ahead! Keith Salvador is a writer who specializes in safety. He grew up swimming nearly every day, even in the winter. He loves pools and nearly everything about them.